This one of a kind handmade pair of 18 karat yellow gold earrings weighs app 4g. Chiseled flowers with a matt and shiny polish. Post fastening for pierced ears. 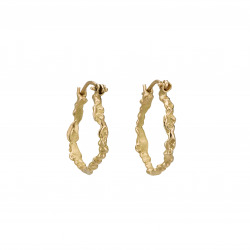 This pair of earrings is made in 18 Karat yellow gold. 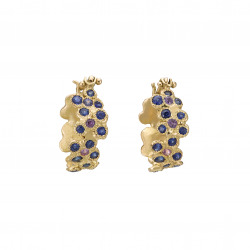 They are set with blue sapphires and the centre of each flower in pink sapphires. Their weight is 4 g approx. 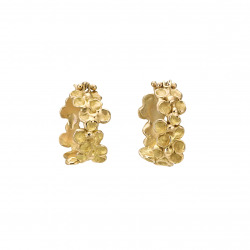 This pair of earrings is handmade in 18 Karat yellow gold. Its weight is 3.5 g approx. Post fastening for pierced ears. 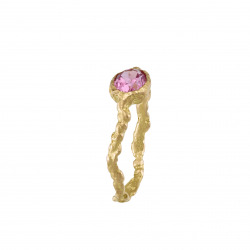 This ring is handmade in 18 karat yellow gold. It is set with a pink Tourmaline of 2ct approx. Its weight is 2 g approx. This ring is handmade in 18 karat yellow gold. Chiseled flowers with a matt and shiny polish. It is set with diamonds and pink rubellite tourmaline app.4 ct. Its weight is app. 4 grm. This unique ring is made in 18K yellow gold. It is set with a beautiful tender pink Morganite from Madagascar of 4.65ct approx. Its weight is 3 g approx. 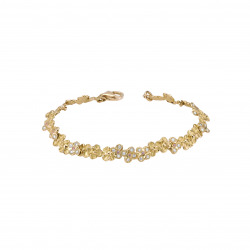 This bracelet is handmade in 18 karat yellow gold. It is set with pink sapphires and diamonds. Its weight is 11 g approx. This ring is handmade in 18 karat yellow gold. It is chiseled with irregular motifs. It is set with a green tourmaline and pink sapphires. Its weight is app. 3,5grm. 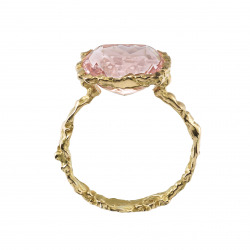 This ring is a unique creation in 18 karat yellow gold. It is set with amethyst and orange sapphires. Its weight is 3.5 g approx.